Several weeks ago, I posted a recipe for Semi-Homemade Cheesecake Fudge Brownies. They are one of Dave and my favorite brownies because we are able to get a little “cheesecake fix” without needing 5 (or more) packages of cream cheese — and without having cheesecake leftovers for the next two months. 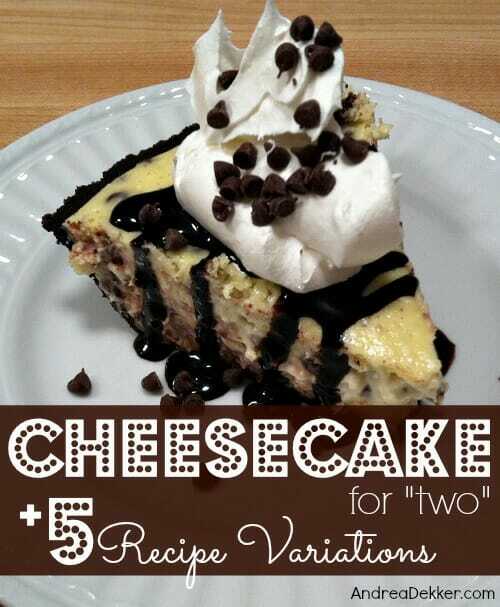 We both love cheesecake, but I rarely ever make it unless we’re going to a party or having company over. However, after I shared my Cheesecake Brownie recipe, a reader emailed me with her super simple cheesecake recipe that makes a MUCH smaller cheesecake. Of course, I immediately had to try it out (I actually had a bunch of extra cream cheese in the house) and it was just as delicious as I had hoped. No, it’s not really JUST for two people, but it does require much fewer ingredients, much less time in the kitchen, and has much fewer calories than eating a full-size cheesecake (especially when there’s just two of us). Add sugar and eggs and blend well, without over mixing, as that causes the cheesecake to crack during baking. Stir in vanilla, flour and sour cream until just mixed. Pour into prepared crust and bake in preheated oven for 35-45 minutes, or until center appears almost set. It’s okay for it to be slightly ‘jiggly’. 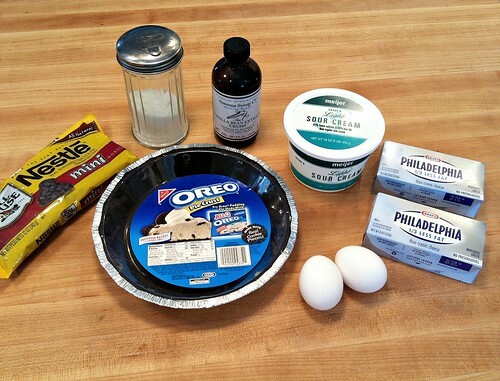 Cover the bottom of an Oreo crust with melted caramel and sprinkle with nuts. Add 1/2 c. chocolate chips to the cream cheese mixture and pour over caramel/nuts. Then drizzle each piece with chocolate, more caramel, and whipped cream! 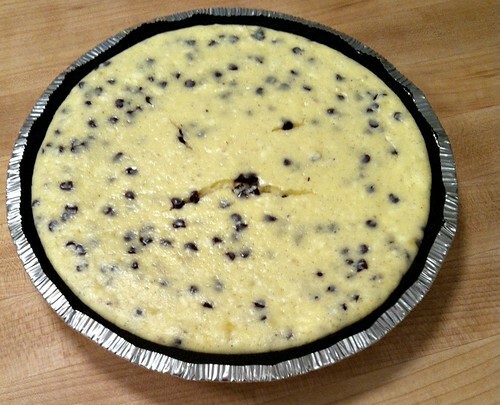 Add 1 c. of mini chocolate chips before pouring into the crust. Drizzle with chocolate syrup or hot fudge. Simply top with canned cherry pie filling or fresh berries, and then a dollop of whipped cream. Melt 1/4. chocolate chips and add to 1 c. of cheesecake batter. Pour the rest of the batter into the crust, then swirl in the chocolate batter. Melt 1/2 c. chocolate chips. 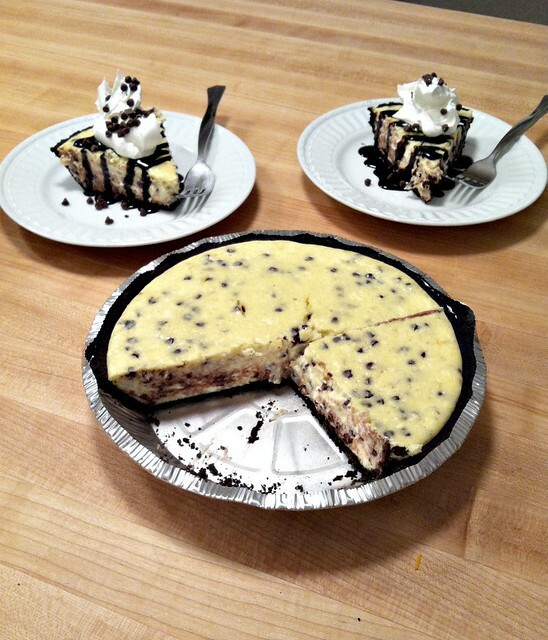 Mix into the entire cheesecake batter and pour into crust. And the prepared crust makes the assembly process so much faster and easier. I made this last night, and it was delicious! Wanted you to know that it was perfect with one block of fat free cream cheese and one block of 1/3 less fat cream cheese. Also used half sugar and half Splenda! Still awesome and you couldn’t tell at all! Thanks Cheryl — glad it turned out well for you too! 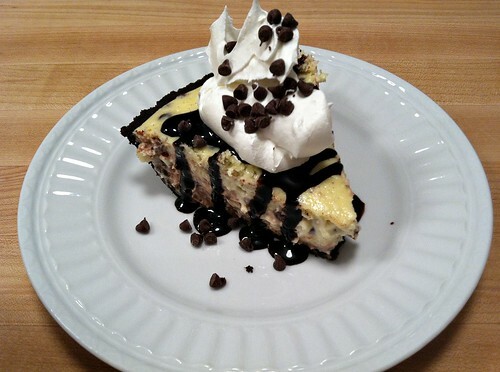 Andrea, I am always looking for good cheesecake-like recipes that use 2 packages of cream cheese or less (because I’m too cheap to make a dessert that uses more than that, lol). Because it has a cakey base layer, it only uses 1 package of cream cheese, It’s still creamy enough to feel like you got a bit of a cheesecake fix without needing an exorbitant amount of cream cheese 🙂 These squares are also sturdy enough to transport well, so great for a potluck! So, since it still does feed more than 2 people, could individual servings be frozen for later? I know there are lots of frozen varieties out there but I’ve never tried to freeze a homemade one. I’ve never tried freezing this — but even with the two of us, it only lasted a few days. It should be fine in the refrigerator for at least 5 days or so. Thanks Sandy — we LOVE the recipe! I made cheesecake for friendsgiving last weekend… it was a total fail! The recipe didn’t call for sugar! (But called for a ton of lemon juice…) I checked about 10 times – but no. I brought it to dinner, put it next to the store-bought apple pie, and felt so smug. After dinner, one by one, people took a bite and slowly smiled, kind of looked funny… except my friend’s grandmother, who said “this is amazing!” A few people spit it out, some swallowed it, and we laughed and realized what the problem was. I was SO disappointed! After the grossness, I asked her grandmother how she could like such a tart, yucky dessert, and she said “Who doesn’t like apple pie??”! Boo. Glad to see yours calls for sugar!